After CAP – No GAP! 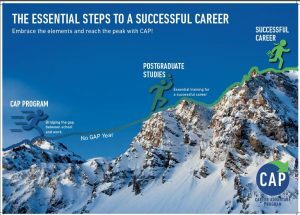 The ‘Essential Steps To A Successful Career’ have been set out in a vibrant and colourful poster which has been recently produced by the CAP Team, designed for display in all OneSchool UK Campuses. One of the fundamental messages here is that students should avoid a potentially detrimental ‘gap’ period between leaving school and taking up Postgraduate Studies. Remember……..after CAP – no GAP! ← February Bulletin is online!